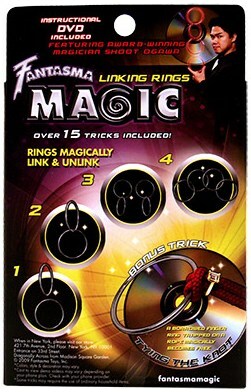 *Four Chrome Rings,*Magic Rope,*Illustrated Instructions,*Instructional DVD Linking Rings with instructional DVD, starring The Ringmaster himself, Shoot Ogawa. The Rings are one of the true classics of magic. Follow Shoot's easy to learn steps and you will be performing a masterful routine in no time. Included are easy and intermediate routines to learn, as well as a Fantasma exclusive performance of Shoot's famous Ninja Rings routine. You also get an absolutely baffling ring and rope trick called "Tying the Knot." A borrowed finger ring trapped on a rope magically becomes free.